I love a good makeup brush. They can make such a huge difference to makeup application and often, I'll wonder how I ever did my makeup without some of my favourite brushes - MAC 217 anyone?! 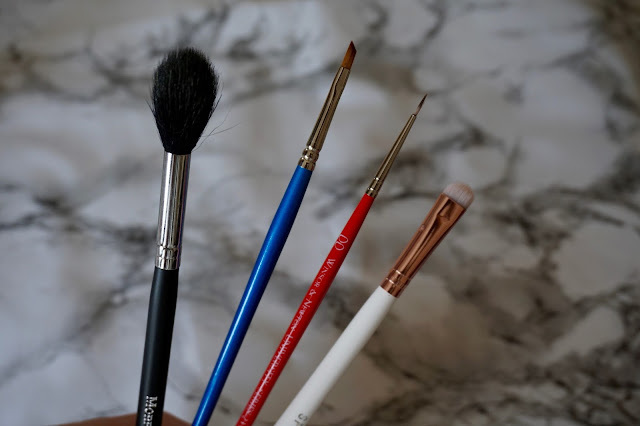 So, today I thought I'd talk through 4 of my new found brush loves, and they're all absolute bargains! Morphe M504 - aka the highlight brush of Youtube. This has been doing the rounds for a while as the perfect highlight brush, and on a late night Beauty Bay order, I threw this into my basket (mainly to qualify for free delivery!) and I've been loving it ever since. It's a beautiful fluffy tapered brush, a weird size somewhere between a big eye brush and a small face brush. It's definitely very small, but I've found it absolutely perfect for precise highlighter application. It deposits the product beautifully, and makes it look so much more pigmented than when I use a bigger brush. The fluffiness of the brush means it blends it all out really nicely. There's certainly a reason why Jaclyn Hill won't stop raving about it - and it's less than £6! Teeny Tiny Eyeliner Brushes - A tip I learnt from a lovely makeup artist I met recently is to get tiny eyeliner brushes from an arts shop! I got these two paintbrushes from The Range for about £3 each and they're fantastic. As you can see they are so super thin, which means applying a thin liner is really easy, and the slightly more angled one will be good for doing smaller wings. So much cheaper than buying a targeted makeup brush, and does the job just as well! Spectrum Marbelous Small Smudger - I did a review of the full marble collection from Spectrum here, and I'm still using them all. However, I had to give a special shoutout to the stubby smudger brush in the collection, and it's fantastic for doing lower lash line eyeshadow. It's got the right balance between firm and fluffy so it applies colour well, whilst still blending it out nicely! This whole collection is fab, but I'm especially impressed with this one. What makeup brushes have you been loving recently? Let me know in the comments!